On Wednesday, April 29, John G. Heyburn II, one of America's most distinguished federal judges, died after a long battle with cancer. He was 66. Judge Heyburn, whose official obituary follows this personal tribute, was a beloved friend of our family. He and my wife were fourth cousins, but their friendship was much closer. He and I shared a love for our city, our country, our history and our Constitution. The following tribute appears in the Courier-Journal (Louisville, Ky.) where I was an editorial writer, then editorial page editor from 1977-2012. What follows is the full obituary from the newspaper, which you could find on the newspaper's website. He will be honored with a funeral and burial. But most of all, he is honored in the hearts of those who remember him -- his smile, his integrity, his love for his nation and his devotion to serving the public good. LOUISVILLE -- One October morning in 2012, my cell phone rang. It was John Heyburn. In his genial, straightforward manner, he asked, "Can you meet me for lunch in ten minutes at Austin's?" Ten minutes later, we were seated in a both, our ice tea served. John got right to the point, one of his many gifts. A dear mutual friend (and my wife's cousin) had recently died of pancreatic cancer; her death was early and tragic. John, diagnosed with advanced cancer some months before, was forthright: "I want to be intentional about our friendship. Let's try to have lunch every month." Then he gave his big-as-all-outdoors-smile: "I think we have a lot to share." It was the first time a friend had said anything like this to me. There were many good times that followed. Although we frequently talked about current events, politics and history, more often we caught up with the news of our families -- our wives, our children. We talked about his mother, who had presided with his late father over a rollicking, intellectual household in St. Matthews where John and his three siblings grew up. He never referred to it as rollicking but his family and my wife's have been friends for generations and rollicking is her description. His beloved wife, Martha, a leading ophthalmologist, and his sons, Will and Jack, were star athletes and academically inclined, like their father. He was so proud of them. John's complete disinterest in gossip or criticism of other people was always so appealing -- and admirable. If he didn't want to venture an opinion about someone, or something, he might say, "Well, that's interesting." (That was one of his favorite words, and he pronounced it precisely, "in-ter-rest-ing.") For someone who is known as "Judge," it was an admirable quality; he was true to the biblical admonition about never judging others. John was very candid about his cancer treatments but always optimistic that they would produce results. There was never a complaint. He lived three-and-a-half more years and issued during that time what may someday be recalled as one of the nation's most important civil rights rulings. This is the one that said Kentucky's amendment banning gay marriage denied due process of law under the U.S. Constitution. On April 28, just one day before his death, the U.S. Supreme Court heard oral arguments in the appeal of several states' gay marriage cases. John's ruling was among them. In the immediate aftermath of his untimely death, the headlines and commentary focused on that case, giving what I believe to be short shrift to his long and productive career and other legacies. In his tenure on the bench and in civic life, there were so many other things that he achieved that made our world better. In time, I hope, these will be more widely saluted. John frequently said that he and I had the two best jobs in town. He got to study, write and make legal decisions as a federal judge. And I got to read, study and write opinions about just about anything as editorial pages editor. He was right. In 1998, he wrote a column for The Courier-Journal's Forum page saying that he thought judges ought to be "activist enough to correct manifest injustices . . . yet restrained enough to allow democracy to work in the fullness of time." John's behavior and demeanor on the bench reflected the man he was in private. He looked at things objectively, and with tremendous perspective. More often than not, he had a smile on his face. He had a great sense of humor. John innately revered history and especially the law although it seems clear that he knew some past legal decisions were flawed. One of these examples is when John articulated the importance of school diversity through his decisions. He knew racial disparities, learned in part when he tutored reading at the Park DuValle Neighborhood Health Center in west Louisville. After lengthy federal court hearings he required, in 2004, he ruled that the Jefferson County School District must consider race as a key factor in its student assignments, so as to retain integration and diversity. At that time he wrote, "Integrated schools, better academic performance, appreciation for our diverse heritage and stronger, more competitive public schools are consistent with central values and themes of American culture." In 2007, the Roberts Court narrowly overturned his 2004 opinion. He never criticized that decision. Such was his reverence for the American Constitution and the rule of law, even if he disagreed. U. S. Senator, Mitch McConnell, now the Majority Leader, whose record in public office is far from complete, can certainly feel confident that one of the best things he has done was recommend John Heyburn for the federal bench. Last October, at the unveiling of John's official portrait at the federal Courthouse in Louisville, published with this tribute, Mitch offered a moving and heartfelt tribute to his old friend." John did more than inspire confidence and respect, he said. Rather he impressed "with his intellect and erudition. ... His impact [as a jurist] has been enormous." And, the Senator added: "He made "you feel lucky to know him." Keith L. Runyon retired in 2012 after 43 years with The Courier-Journal, where he was opinion pages and book editor, among other things. He is now a commentator on public radio and for the Huffington Post. The Honorable John G. Heyburn II, 66, United States District Judge, whose passion for the rule of law, wisdom, joy and kindness enabled him to rise to national leadership in the governance of the Third Branch of the U.S. Government, passed away peacefully on Wednesday afternoon, April 29, in his beloved home surrounded by his family and God's Heavenly Country. He was born on Nov. 12, 1948, in Boston, MA, to Henry Reuter and Frances Starks Heyburn. Judge Heyburn graduated from Milton Academy (1966), where his track records remained unbroken until they were retired upon the building of a new track; Harvard University (1970), where he earned varsity letters all four years as a member of the decorated and undefeated Harvard track team led by the legendary Coach Bill McCurdy, as well as the Cross Country team; and the University of Kentucky College of Law (1976). In law school he was a member of the National Moot Court Team, a runner-up in the Sixth Circuit Moot Court Competition and a member of the Order of Barristers, an Appellate Advocate Honorary Society. He later served his alma mater as President of the Law Alumni Association and established the Henry R. Heyburn Alumni and Public Service Award there. In June, he is to be inducted into the College of Law's Hall of Fame, the highest award given by the law school presented to alumni who have distinguished themselves by contributions in their own field of work or in the betterment of humanity. He served in the U.S. Army Reserve from 1970-1976; he retired as a First Lieutenant with an Honorable Discharge. He began his legal career as an associate and later partner at the firm then known as Brown Todd and Heyburn, where he specialized in litigation. His love of politics was manifest in his early work for the 1971 gubernatorial campaign of Tom Emberton, where he made lifelong friends, including Sen. Mitch McConnell, in whose earliest campaigns for Jefferson County Judge/Executive he worked and for whom he consulted during Sen. McConnell's tenure as County Judge. He also ran two campaigns for public office himself, for Jefferson County Attorney in 1981 and for Jefferson County Judge/Executive in 1989. Like his father and grandfather before him, Judge Heyburn was a leader in civic life. From 1983-1986 he served as chairman of the Louisville- Jefferson County Crime Commission. He served as a director of the Louisville Bar Foundation (1986-1988, 1994-1999), and director of Kentucky Citizens for Judicial Improvement (1975-1976). He served on a wide variety of boards including Cave Hill Cemetery, Inc., Louisville Committee on Foreign Relations, Louisville Free Public Library and Cedar Lake Lodge. He enjoyed memberships in a wide variety of professional, personal and sports related clubs , including The Royal Dornoch Golf Club in Dornoch, Scotland, the U.S. Seniors Golf Association, and Salamagundi, a Louisville speaking club over 100 years in continuous existence. In 1992, Sen. McConnell recommended him to President George H.W. Bush for appointment to the U.S. District Court for the Western District of Kentucky. In an unusual show of bipartisan support, Sen. Wendell Ford also endorsed Judge Heyburn's nomination. Twenty-three years later, he has demonstrated clearly to all his unbiased commitment to accuracy in the application and interpretation of the law. 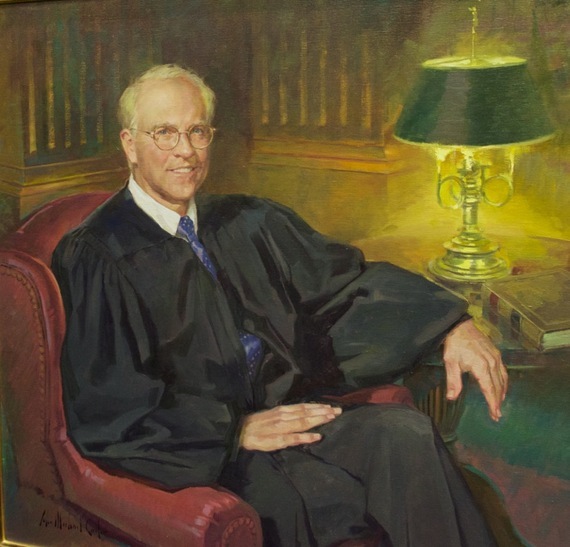 He is remembered as a master of the courtroom, a delightful colleague and an artful chief judge of the Western District, who was known for his depth of preparedness, wisdom, humor and kindness. The late Chief Justice William Rehnquist appointed Judge Heyburn to the Budget Committee of the U.S. Judicial Conference in 1994. He rose to chair this committee and hence was in charge of the budget for the Federal Judiciary for eight years beginning in 1997. As chairman, he was called to interface and collaborate with House and Senate leaders, testify before various subcommittees and consult with foreign governments regarding judicial reform -- tasks all well suited to his interest and knowledge of political and governance interests as well as the structure and needs of the Judiciary. In 2007, Chief Justice John G. Roberts appointed him to chair the Judicial Panel on Multidistrict Litigation, which works to identify complex cases in Federal courts across the country and centralize them for efficiency and consistency. In 2014, his final year as chairman, the cases that came before the panel accounted for 38% of the civil cases filed in the Federal system. In his characteristic fashion of always seeking to improve, he thoroughly modernized the panel's rules and procedures, resulting in streamlined procedures, increased accessibility and accountability, transparency of the process and amplified training for new and sitting judges presiding over such complex cases. His vision of judicial service was not merely to decide cases, but to help hold together and, wherever possible, to improve a legal system already the envy of the entire world. His vision was always for improvement, transparency and efficiency on both sides of the process. He treated the arguments of each lawyer and each party with respect and taught his clerks to do so as well. This kind, dedicated and respectful manner guided him in all he did. He took a special interest in sharing the joys and concerns of his family and others such as law clerks, colleagues considering life changes or young people furthering a passion such as a sport, college or graduate school or careers. More than anything, the quality that most defined and informed him and his actions personally and professionally was that he loved life and the individuals he encountered. He had an ability to cut through a concern to its essential quality often not identified in the question brought before him. He saw promise and ability in others where some felt uncertainty and confusion in themselves. He inspired confidence with his insights and observations. His was a loving, observant, joyful and patient spirit who left us all better for having known him. How unique for such a wise and masterful judge to have lived in and out of the courtroom without making a judgmental or critical comment about another person. He was preceded in death by his father, Henry R. Heyburn, a prominent attorney, who was a founder of Brown Todd and Heyburn law firm (now Frost Brown Todd); politician, state senator, civic leader and World War II veteran, who earned both a Silver Star and a Bronze Star. He is survived by the love of his life, anchor, partner and wings in the joys and relationships of life as well as the challenges, Dr. Martha Keeney Heyburn; two sons, William Arthur Heyburn of New York City, and John Hail Heyburn of Washington, D.C.; his mother, Frances Starks Heyburn; two brothers, Franklin Heyburn of Vermont and Henry (Alicia) Heyburn Jr. of Maine; a sister, Frannie Pistell, of Long Island; their children, his nieces and nephews, as well as his brothers-in-law and their sons, who are like brothers to his sons; and he is survived by all those he loved and mentored, and the institutions he served and worked to leave better than when he accepted the challenge of their leadership, which may be his living legacy. A Celebration of His Life will be held at St. Francis in the Fields Episcopal Church, 6710 Wolf Pen Branch Road (at the corner of U.S. 42, near the Gene Snyder Freeway) at 10 a.m. Friday, May 8, with burial to follow at Cave Hill Cemetery. A visitation will be offered at the church on Thursday, May 7, from 1 to 4 p.m. and 5 to 8 p.m. In lieu of flowers, the family suggests contributions to Norton Cancer Institute, where gifts will be used to improve the care and outcomes of other Kentuckians battling cancer now and in the future, in care of Lynnie Meyer, Director of the Norton Healthcare Foundation, 234 E Gray St. #450, Louisville, KY 40202; (502) 629-8060.